Given the right conditions, rosemary plants thrive, eventually reaching heights of 6 to 8 feet. They grow out as well as up, sending out stems that seem determined to explore their surroundings and invade the space of adjacent plants. If your rosemary plant has grown out of control, it’s time to take drastic action. Rejuvenation pruning of rosemary may be needed. Can You Hard Prune Rosemary? Gardeners are sometimes hesitant to make drastic cuts on rosemary shrubs because a few herbs with similar, woody stems don’t recover if you make severe cuts. A mature rosemary plant, however, tolerates this drastic pruning, even into the woody parts of the stem. You can do light pruning and harvesting any time of year, but a rosemary plant responds best to hard pruning in winter when it isn’t actively growing. When pruned in winter, the plant grows back in spring looking better than ever. Read on to find out how to rejuvenate a rosemary shrub. Note: For most people who grow rosemary, the plant will go through a cold period. 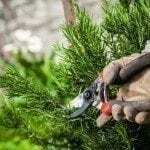 It isn’t a good idea to prune any herb, rosemary or otherwise, shortly before or during cold because it will cause the plant to grow new shoots, which are very vulnerable to cold damage. In warmer areas where rosemary is more apt to grow to the size in which rejuvenation pruning is needed, the plant is not experiencing the same killing cold, so winter pruning while it’s in dormancy is best. That being said, for those of us NOT living in such areas, stick to spring pruning after the threat of frost has passed. The first step in rejuvenating rosemary plants is to determine the size at which you want to maintain the plant. Cut the shrub back to about half of the desired size, and by the end of spring it will fill the allotted space. 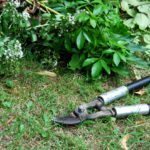 You can maintain the size of the shrub through summer with light pruning and harvesting. Cutting through the thick, woody parts of the stem on a mature rosemary shrub may be too much for your hand pruners. If you find the stems hard to cut, use loppers with long handles. The length of the handles gives you more leverage and you’ll be able to make the cuts easily. When tender new shoots replace the old growth, you’ll be able to make cuts easily with hand pruners. Don’t toss the prunings on the compost pile! Save the best tips to start new plants, and strip the needles off the remaining stems for drying. The tough stems make excellent kabob skewers.